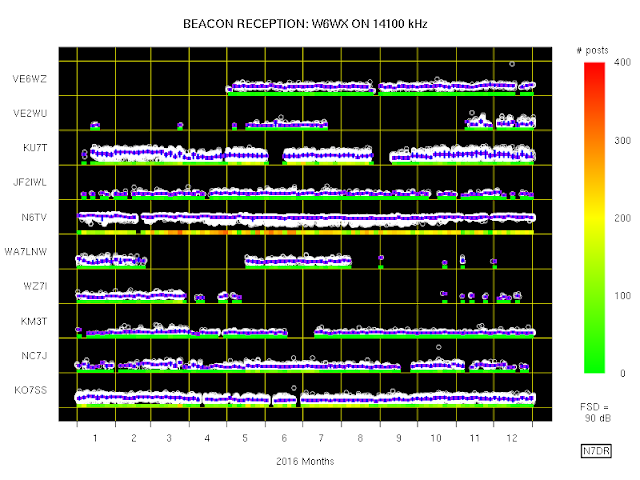 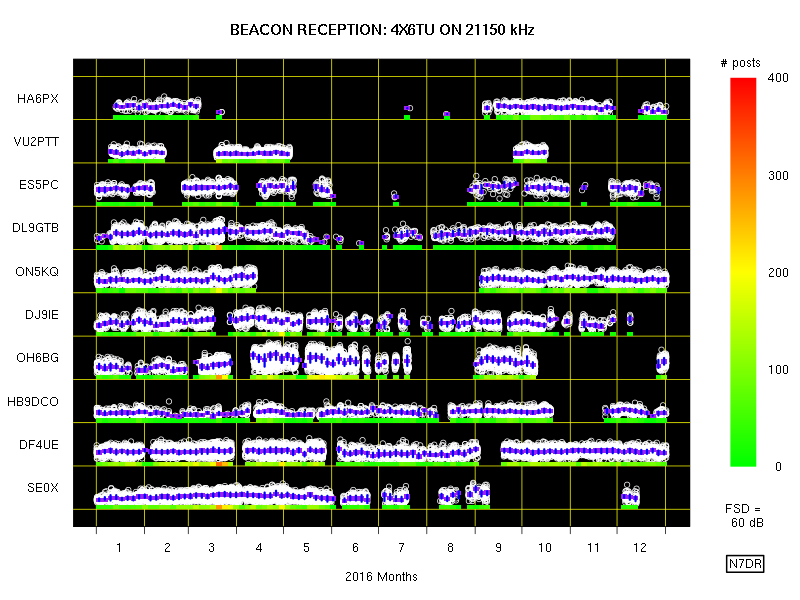 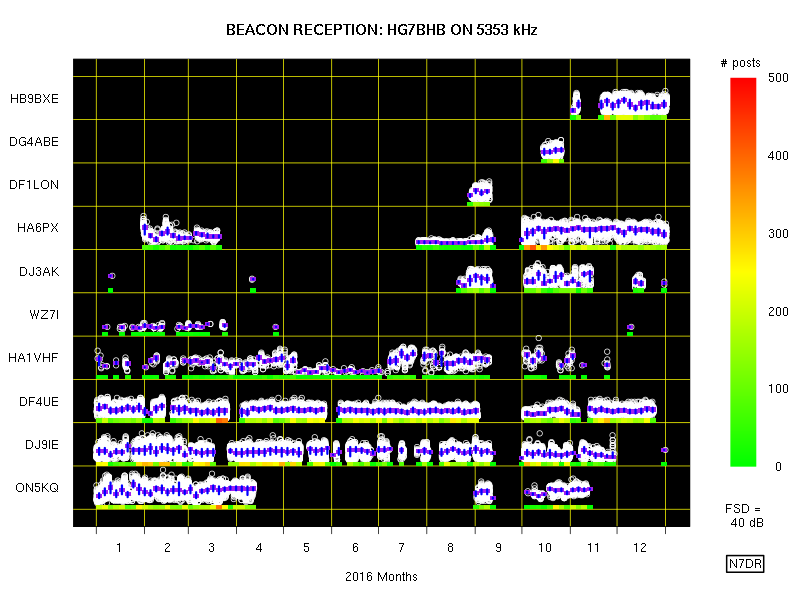 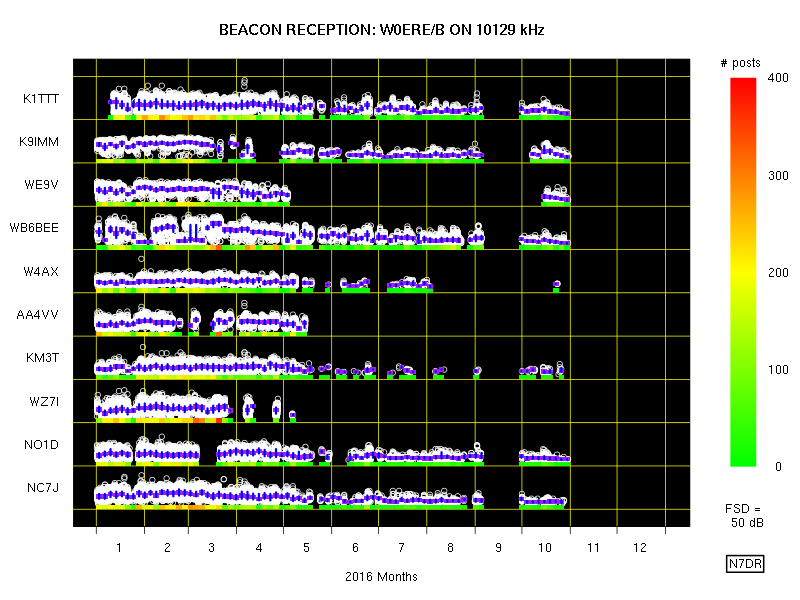 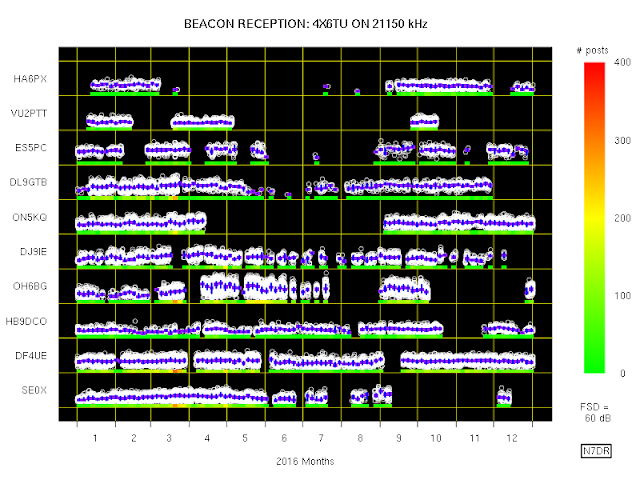 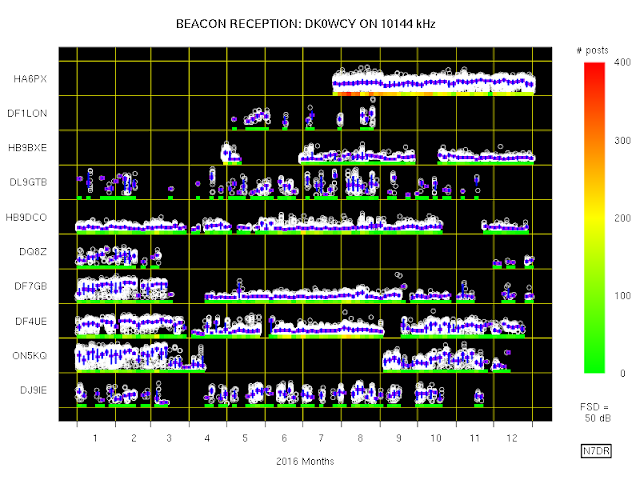 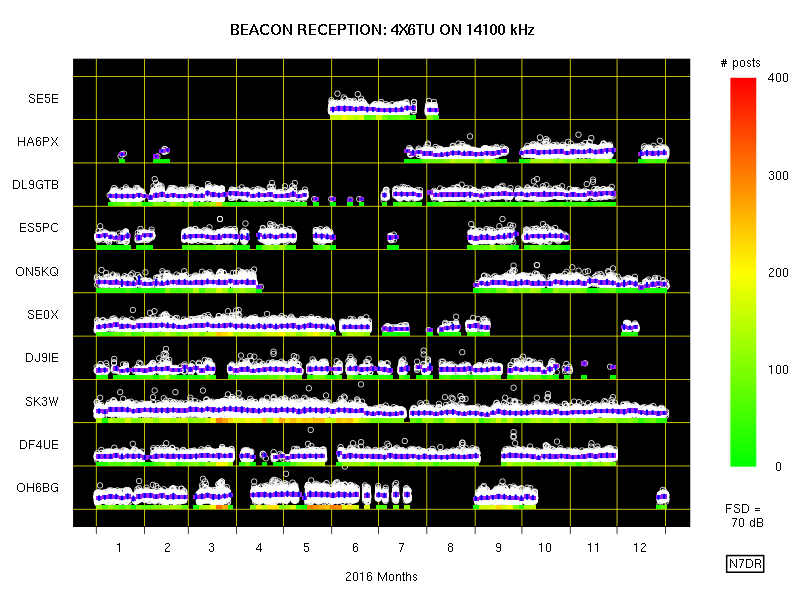 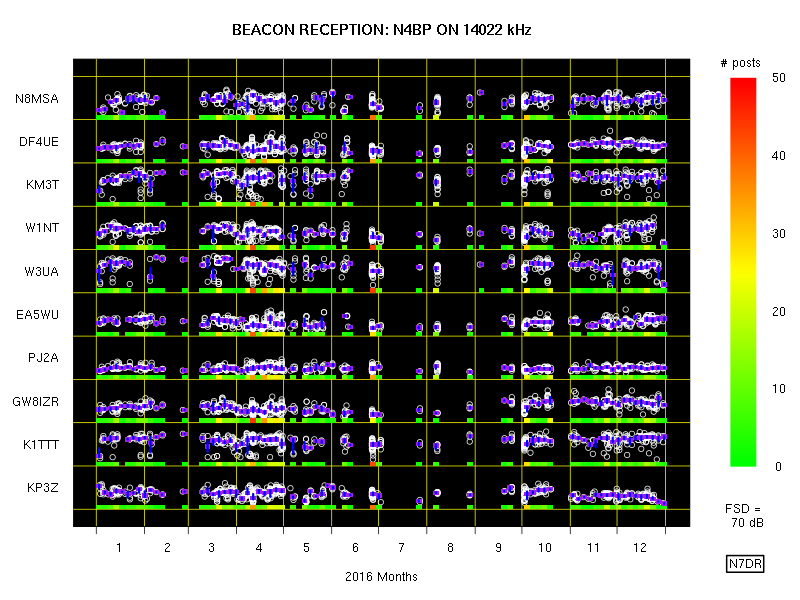 I previously posted graphs showing the signal strengths of the most-frequently-reported signals from HF beacon stations, covering the period from the inception of the Reverse Beacon Network ("RBN") in 2009 to the end of 2016. 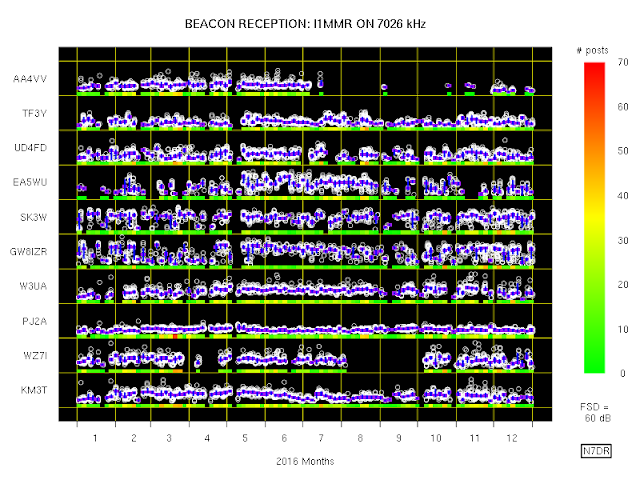 Naturally, similar plots can be created for arbitrary periods, and such plots might contain interesting features other those on the long-term plots. 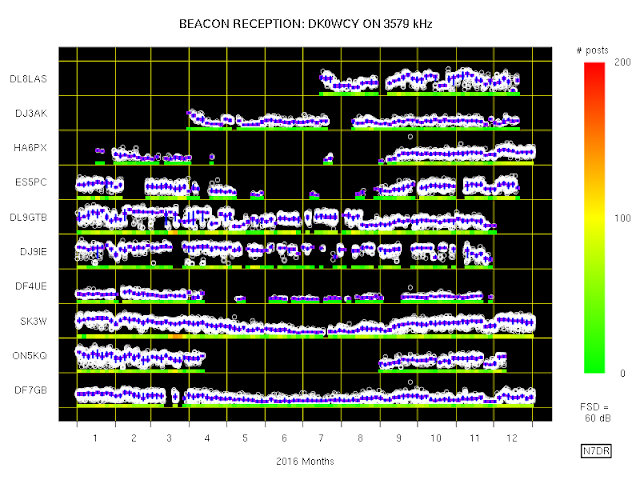 Here I show plots covering 2016; similar annual plots covering the entire period from 2009 to 2016 are available here (the file has the MD5 checksum d868a05ff2945c0eefe81b68f1d0c301). 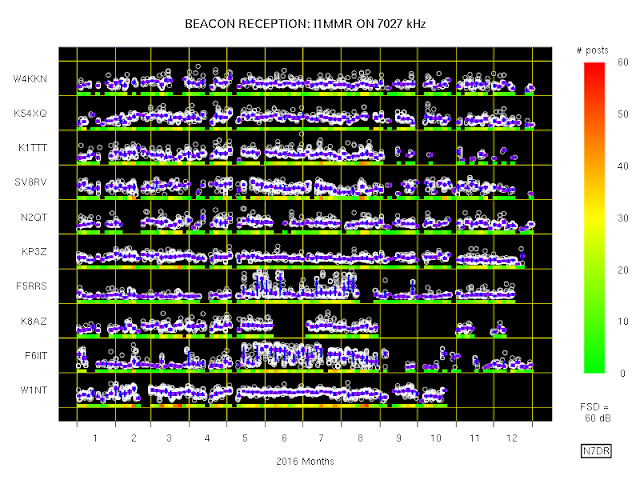 As before, each point on the plots covers one one-hundredth of the total span, or, in this case, roughly three and a half days. 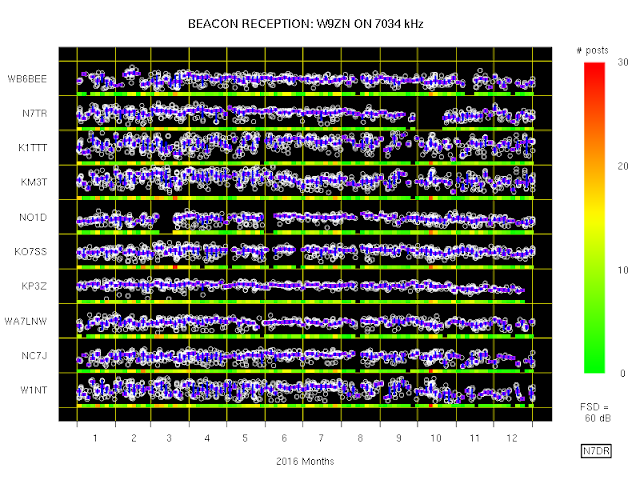 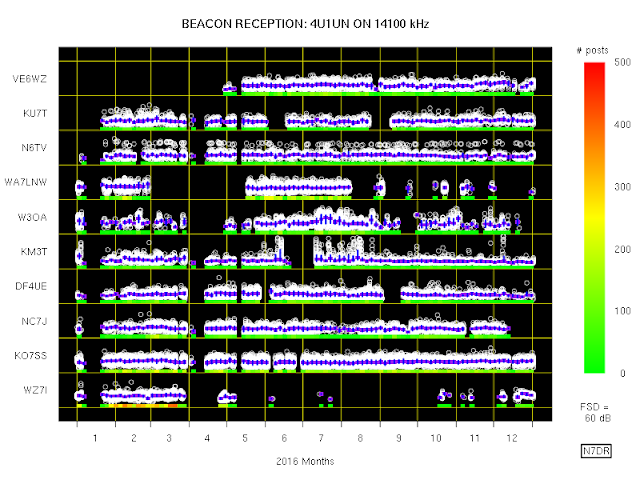 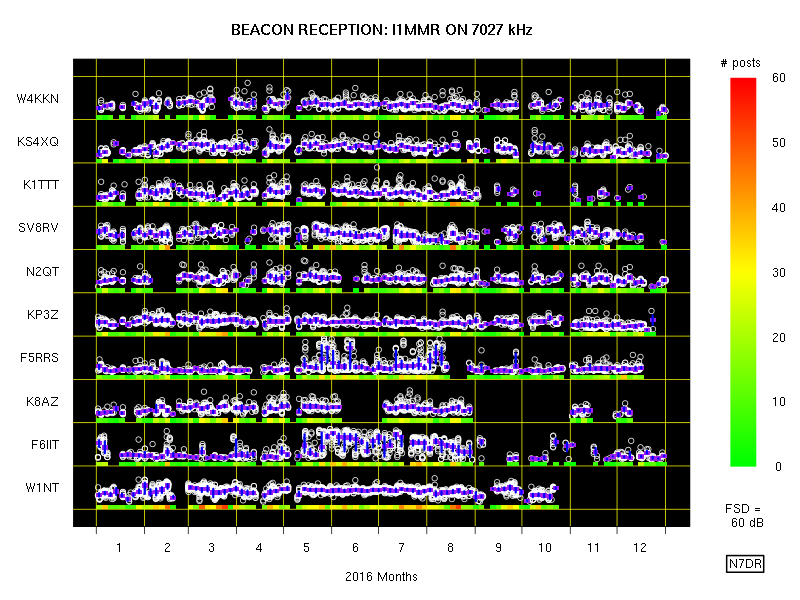 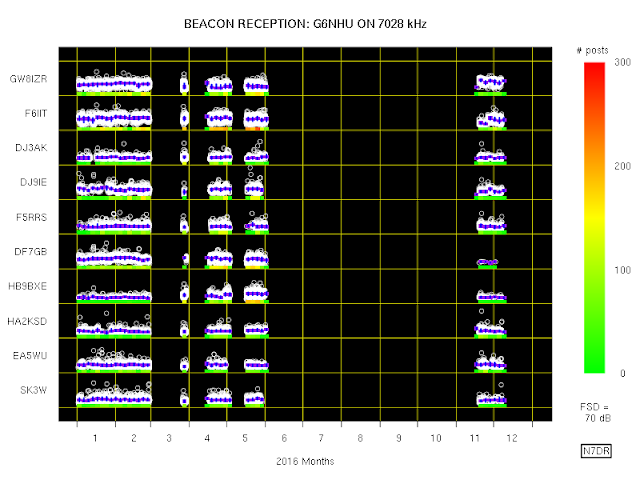 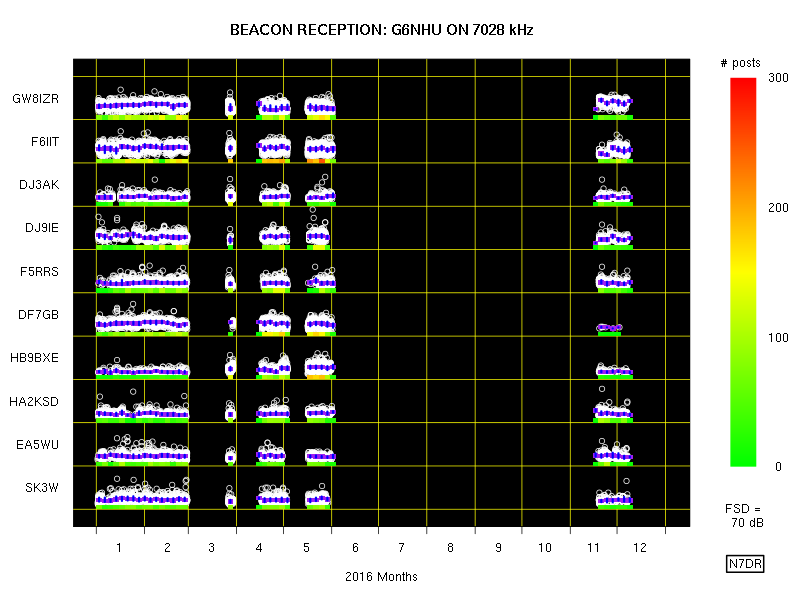 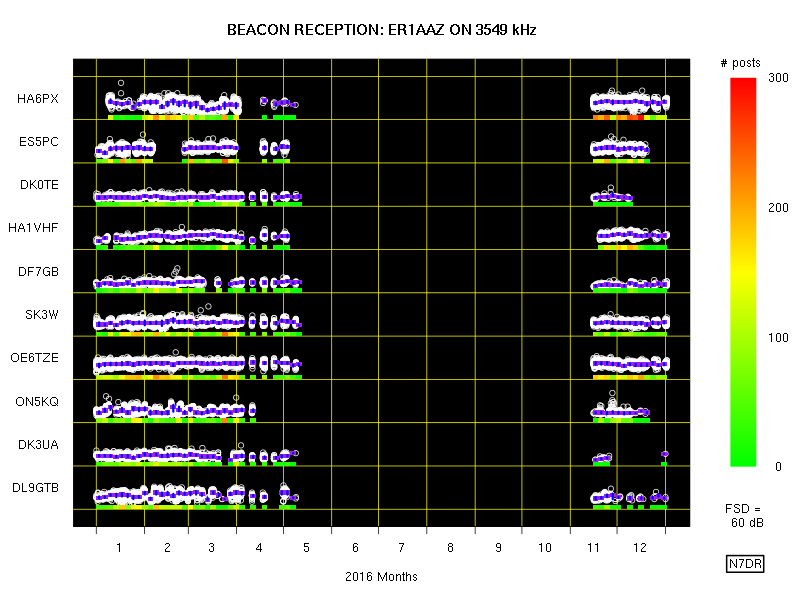 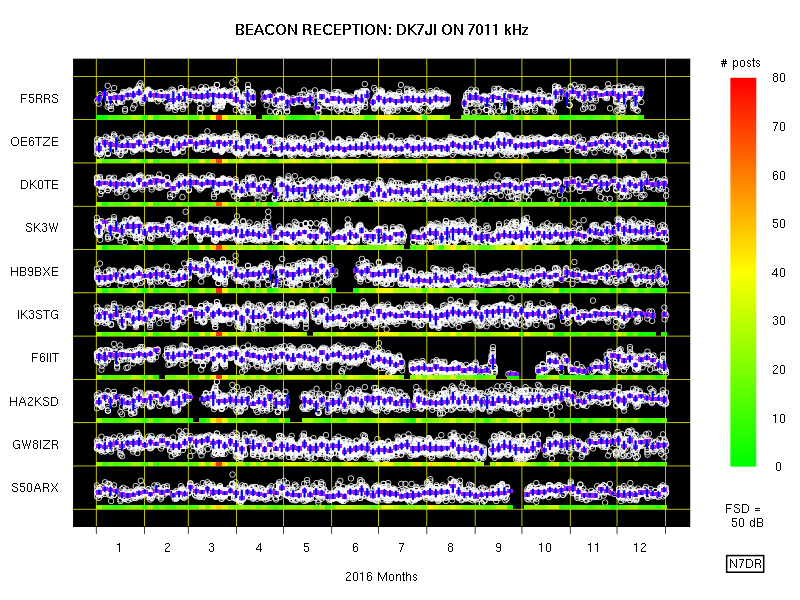 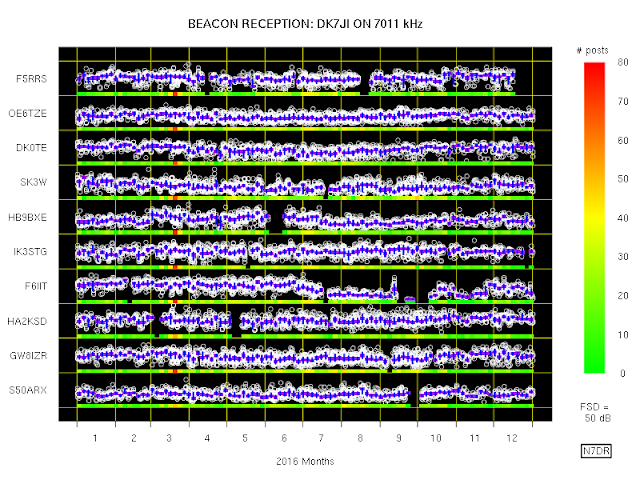 Also as before, for the period covered by each plot we first determine what qualifies as one of the top twenty beacons reported by the RBN, and, then for each such beacon, which ten RBN posting stations have spotted the beacon the largest number of times over the duration of the plot. 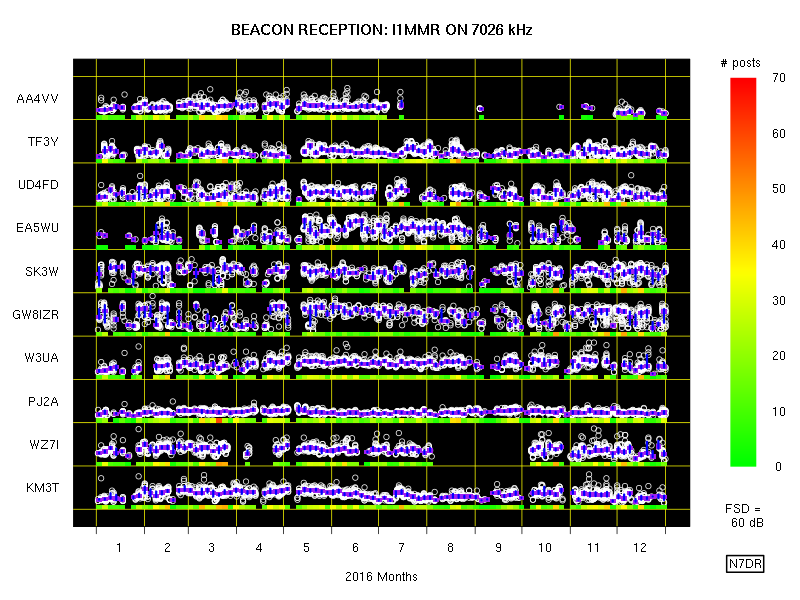 The ordinate for each of the strip charts ranges between 0 dB and the value shown as FSD (i.e., full scale deflection) near the bottom right-hand corner. 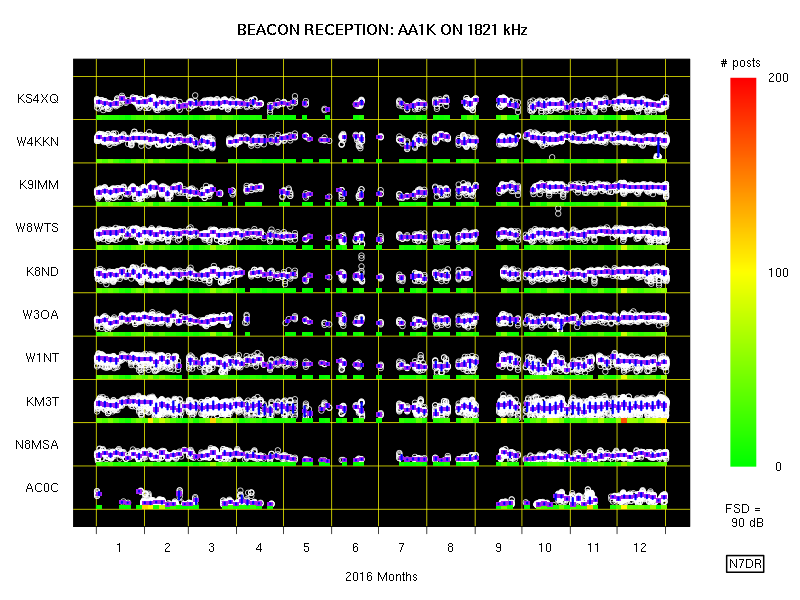 The abscissa is divided into a number of bins of equal duration. 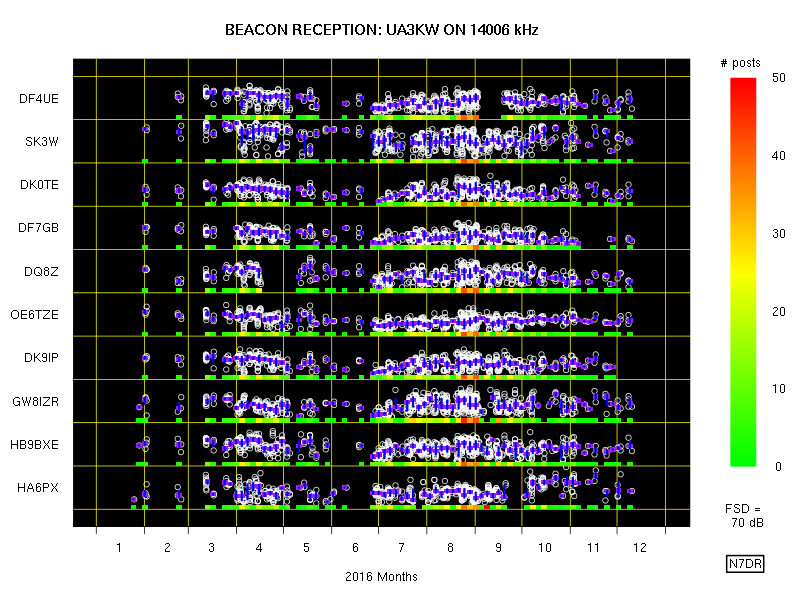 In the plots on this page there are 100 such bins; because the duration covered by each plot is one year, each bin therefore covers about three and a half days. 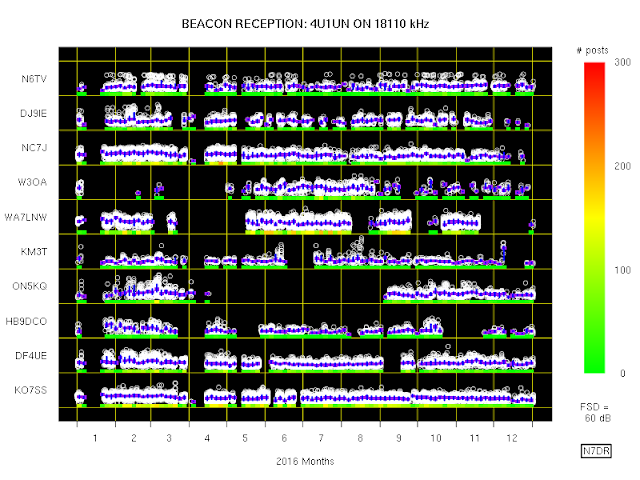 For the period covered by each bin, a small purple rectangle represents the median value of the SNR over the duration of the bin. 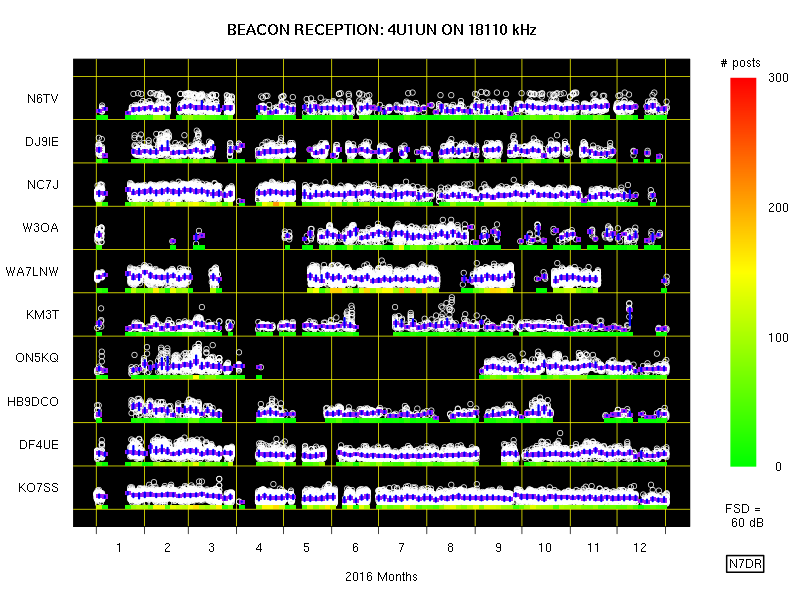 Also for the period covered by each bin, the inter-quartile range of the SNR at each RBN station is indicated by a short vertical blue line. 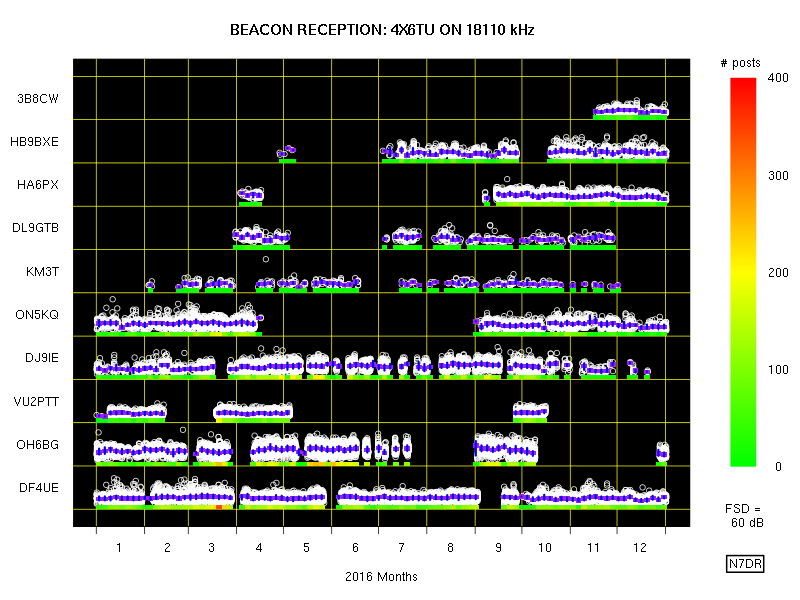 §97.119 of the FCC regulations appear to disallow the use of the "/B" indicator as used by the station signing W0ERE/B, as the B series is allocated to China. It is my memory that the original HF beacons were all located on 28 MHz, so that listeners could be made aware of an opening. 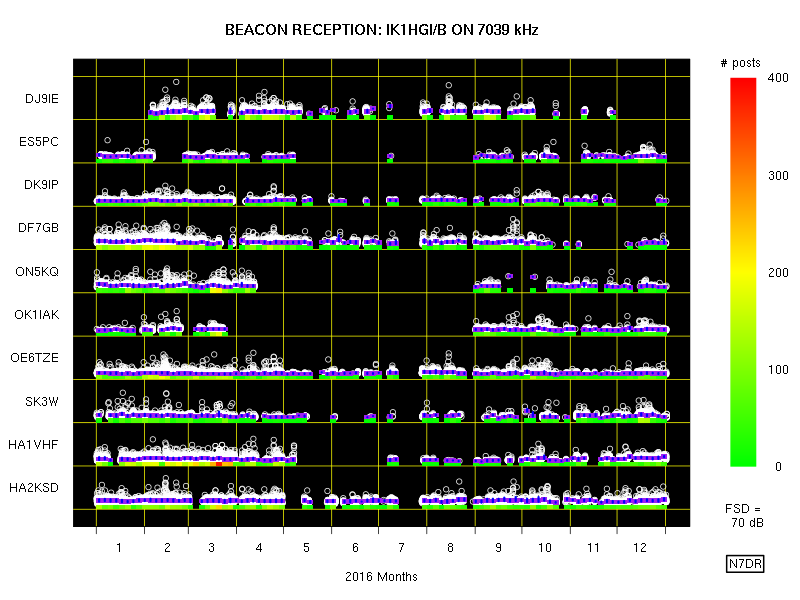 It is noticeable that not a single one of the stations on the list above is on 10m: the vast majority are on bands that can reasonably be expected to support some kind of non-local propagation at almost all times (which is probably the very reason that they are posted by the RBN so often -- but one does wonder what the putative purpose of such a beacon is).